Last week we read “Planting a Rainbow” by Lois Ehlert. 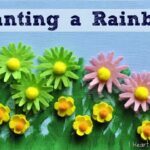 It was perfect for Spring since it’s about a Mother and child who plant flower bulbs, seeds and plants and watch them grow into a rainbow of colorful blooms. What perfect timing since all the beautiful Spring flowers are starting to pop up in the neighborhood! After we read the story we went on a walk around the neighborhood to try to spot out some of the pretty flowers we had seen in the book. We talked about what colors they were, what shapes they were, how they smelt, and also about how God created them for us to enjoy. 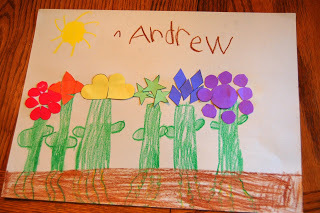 When we got back home we reviewed the book again to point out which flowers we had seen and also to go over what the rainbow sequence colors were again. A couple days later we read the book again and decided that we should make our own rainbow gardens. 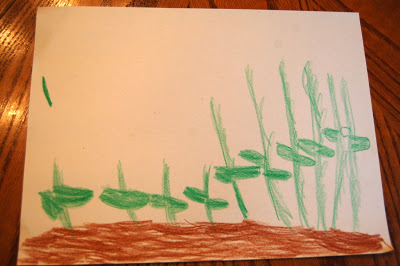 We took a piece of white construction paper and each colored the bottom of the paper brown for the ground, and then colored green flower stems coming out of the ground. 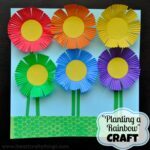 As prep before we started this activity I had cut out several different colored shapes to make our flowers out of. This was a bit tedious and time consuming but my son helped me so it went a little bit faster. The magazine suggested using foam shape stickers, but I couldn’t find any so I just made up my own. The best part is that if you decide you want to do this activity, I saved all my pages with the shapes on them so I could email them to you for you to print off. 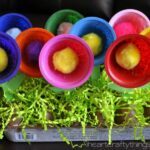 Before we assembled our flowers we sorted our shapes by colors and then went through naming all of the different shapes. Since my youngest is preschool age, it was perfect practice for him. We also sorted them from least to greatest so we incorporated counting too. The one thing I forgot to do is to have them make patterns out of the shapes, but you could totally do that too to practice patterns. 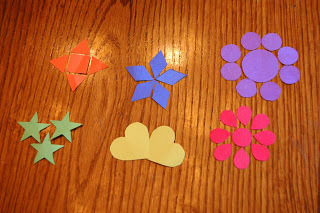 Then we practiced using the different shapes to make different flowers, whatever we could think of. The boys were super creative, I was impressed. 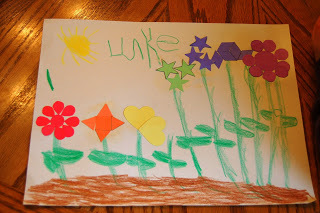 Finally, we glued our colorful shapes onto the paper to make our rainbow garden. The boys took it a step further and colored a sun on the picture and even some roots under the flowers in the ground. So go check out this cute book from your local library and start smelling the pretty Spring flowers!!! **I got the idea for this craft from “The Mailbox” a magazine for Teacher’s. So sweet 🙂 This blog is very interesting.